Love great props and puzzles? Love escape rooms but hate having to win the game in a certain time. 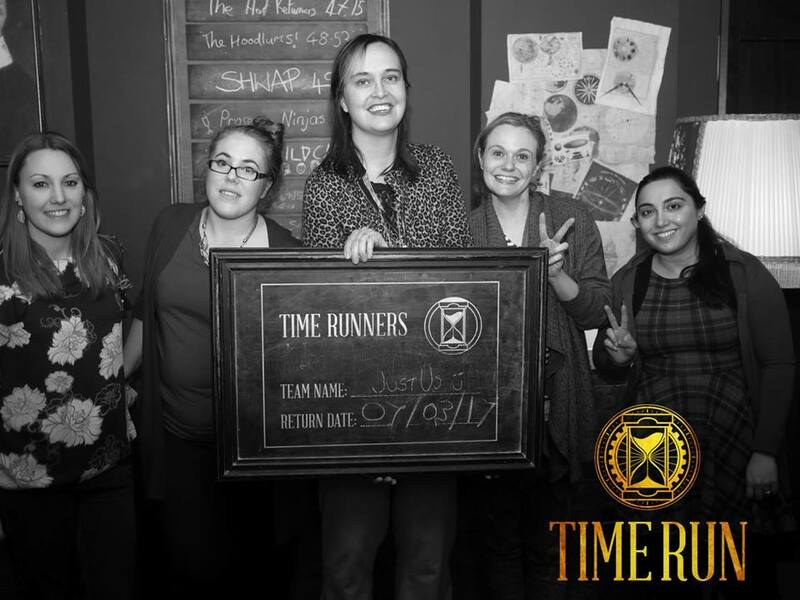 This escape room even though you still have a set time your team is scored instead on how you completed the different rooms. In The Celestial Chain a rogue goddess, once imprisoned, has broken free of The Celestial Chain. Gather what you need to bind her, once again: or risk the end of the world as we know it. You will need to gather the artefacts you need from across time to imprison an ancient force. The escape room is designed for 3-6 players. Thanks to Time Run who let some of the community of Love Pop Ups London come down on a discounted promotion offer. Read all members blogs/reviews from the comments section below. Thanks to Love Pop Ups London and Time Run I got to try out the new escape room Celestial Chain. A roman Goddess has escaped and we needed to gather artifacts to bind her or risk losing the world as we know it. To read more go to my blog. Time Run really does take escape games to the next level! It certainly isn’t your usual escape room (i.e. solving puzzles to get out of 1 locked room) but, as described by themselves, is an immersive adventure game with great sets, fabulous actors and a well thought out story line. Their newest game, The Celestial Chain, is even more out of this world with at least 5 rooms set over different time periods and only 12 minutes in each to solve a range of puzzles to find the artefacts to complete the game. The pressure is on! It is designed for 3-5 players however is seriously tricky – with only 3 people you would definitely struggle to complete it. The rooms definitely range in terms of the different types of puzzles as well as the amount. Some only require 1 or 2 people and others need many more! To be honest at the end I came out not really knowing whether we had “escaped” and felt a little disheartened with the amount of puzzles we had solved, however we were taken through the scoring system (not overly clear and a little too subjective for my liking!) and I started to reflect on what we had actually achieved and cheered up! Overall a fantastic experience made so because of the immersive aspect as well as some very clever puzzles, a consistent story and a clear end goal. Honestly I think it is very pricey however would definitely recommend for a birthday or team building exercise. The escape room is a series of different rooms that you have a specific amount of time in each before moving onto the other. The rooms feel a little like Crystal Maze with physical, mental, skill and mystery elements in each. You had rooms where you had to work all together and rooms where you had to split up to complete individual tasks. I got tickets for Time Run through Love Pop Ups London to try out their new game, The Celestial Chain. I was really excited when I heard that Time Run had a new game, being a fan of the first one, The Lance of Longinus. On a practical note, they don’t let you in early, and there’s no waiting area, so try to arrive just a few minutes before your time slot. From the beginning, the entrance with the cool door, and the in-character staff welcoming us straight into the story with his old timey accent, it was very promising. I love the interior of their space and that the staff is dressed as if they’ve just stepped out of Victorian times. The game also uses a really fun and well-done video with Victorian character Luna Fox to further introduce you to your mission across space and time, as well as Babbage the robot whose voice will give you hints through the games if you need help. There are 5 rooms and you have 12 minutes in each. The moment when the video is over and the “portal” opens for you to enter is pure magic! They have definitely kept up their production values, with great props and room designs but overall the game was not as fun as the first one. I think the main reason for this is with the way the new game is set up, you don’t get a sense of achievement. In fact, most of the time we thought we were doing really bad, and my entire team was really surprised to find that we had scored a decent mark. If you can’t even tell if you’re doing well or not, it takes away from the satisfaction of the game. I guess players should keep in mind, that even if they haven’t reached the goal for most rooms, they can still make up for it in the last room. On top of that, the game is set up so that the final room is not really pass or fail, it has levels of success. The first room was the most fun for us, with the most intuitive set up, reminiscent of the Crystal Maze type games and a crane was involved. The second room is where it all started to fall apart, with our team split up for 3 tasks and not a single team getting anywhere with it in the allotted time. It was a bit frustrating to get nowhere and I think the puzzles in that room could use some redesign, as trial and error isn’t really a fun strategy in the short time you’re given. The third room was an improvement, and also reminiscent of the Crystal Maze’s physical challenges. The fourth was not bad, but set up in two rooms so that if you don’t have the correct number of players in each place, you will lose a lot of time, which is annoying. I found the challenges unnecessarily detailed in that room and difficult to finish in the allotted time due to quantity not quality. The fifth room is where the game story reached a climax and storywise it was fine, however there is actually that much for one to do in there. They gave us a score card in the end of how we did, which is interesting to see. Overall it was a well-done game but I would have preferred that some of the puzzles were more intuitive like the ones in their previous game, although I did appreciate the physical ones in the first and third rooms.